Before we can explore the discourse surrounding the theme of religious reformation in the videogames Final Fantasy X (Square, released in Japan 2001) and Dragon Age II (BioWare, released universally in 2011), it is important to define what is meant by ‘reformation’. The Collins dictionary definition is, ‘1. improve 2. reconstruct – vi. 3. abandon evil practices’ (p. 620) In this case, in order for change to occur within a current system, everything has to be altered; the entire system has to be reconsidered, not slightly altered. Within the two videogames discussed here the characters take drastic measures to alter their respective societies into what they believe is better, but each story does so with very different tones and moral choices. Reformation encompasses race, class, religion, politics, gender, sexuality but for the sake of focus, religious reformation will be the main study of this essay as it is the most prominent change within these two videogames. If you’re currently playing the games in question, be warned: this post has spoilers. When Final Fantasy X (FFX) and Dragon Age II (DA2) were created it is possible that the religious symbolism and anarchist tendencies utilised within them were simply tools to build immersible worlds. 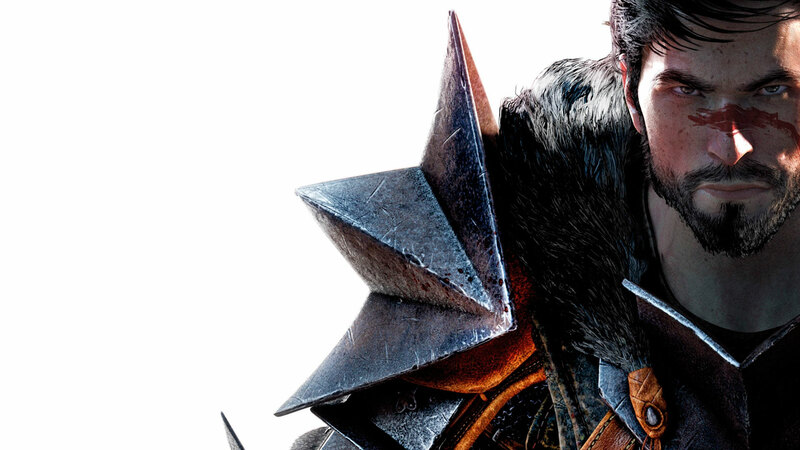 On BioWare discussion forums David Gaider himself, the main writer of DA2, frequently dismisses claims that the creators made conscious links to religious figures and current issues concerning activism. But this does not mean that DA2 or FFX do not critique our moral system or our ability to question the system of society. The games have profound messages even if they are ‘unintentional’. Ian Bogost argues that, ‘Serious games replace the cycle of capital with the cycle of political regimes, the cycle of industrial production, the cycle of institutionalized social goals.’ (2007, p. 320) This means that videogames have the potential to persuade and challenge the real world. Games like FFX and DA2 are underestimated in their cultural value due to their pixelated medium but they can have a profound impact on today’s generation of gamers. Videogames are a free-form place, an environment that can reshape or alter the real world to reflect our everyday lives, desires and morals. And because it is a visual medium that stimulates sight, sound, active decision making and creativity; interactive stories – like DA2 especially – can give the gamer an accessible way to emote and invest in the issues that arise within a free-form world. On the one hand, videogames can represent ethical doubt through logics that disrupt movement along one moral register with orthogonal movement along another. On the other hand, videogames can represent ethical positions through logics that enforce player behavior along a particular moral register. FFX is the more complex of the two worlds to break down. It draws from Catholicism, Buddhism, Hinduism and Taoism, to name a few. 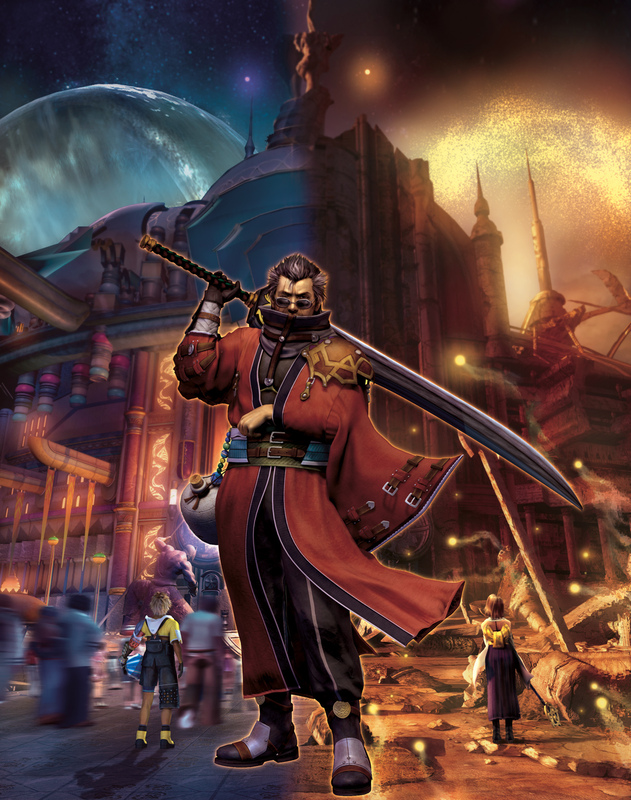 With such a diverse foundation for its religion, even in its alphabet and holy song – Siddham Sanskrit script and mantra-like chants – it is possible that FFX can be viewed not as a critique on one culture’s beliefs but on the very concept of organised religion. The object of suffering within FFX is hi-tech machinery called ‘machina‘ and anyone who uses machina is a heretic keeping suffering alive. The origin of this technophobia arose a thousand years before the game starts when a summoner (a magic user) called Yu Yevon summoned a creature the people named “Sin“. Sin was programmed to destroy any city that used machina and so, to protect themselves, the Yevon Church was formed. The Church banned machina in the hopes of appeasing Sin but in order to enforce this rule, teachings were written that said machina made people lazy – made them proud and arrogant – and this was mankind’s sin. Now, despite four successful attempts to kill Sin, he is always reborn, creating a cycle of death and rebirth to remind the people not to use the forbidden technology. It is easy to see a mixture of ‘original sin’ from Christianity – mankind must repent for the crime of one man, in this case a generation – and the cycle of death and rebirth; the wheel of suffering from Buddhism. When researching for this essay I read a lot of Helluin’s lenses. Her lens Final Fantasy X Symbols & Glyphs in particular informed me about the foundations of FFX’s religion. It’s worth reading if you’re interested in glyphs, symbology and religious mythology. This theme of original sin carries over into DA2. It is much more obvious, too, as its central, ruling religion draws heavily upon Christianity rather than a mix of beliefs. The crime here is that the people idolised monsters, the Old Gods created by the Maker, instead of worshiping the Maker Himself. This angered the Maker and so He turned His back on the world. This false worship is deemed by the Chantry, the church of the Dragon Age world, as the ‘original sin’. To directly quote the Bible we can almost tie together how machina and the Old Gods both represent the snake by offering forbidden knowledge, ‘Now the serpent was more crafty than any of the wild animals the LORD God had made.’ (Gen. 3:1) This ‘craftiness’ is especially true for the Old Gods as they misled the people even further after the Maker discarded them. The Old Gods eventually managed to lure a select few mages (magic users) into entering heaven and sitting on the Maker’s throne, but their pride and arrogance corrupted it. The Maker cast humanity aside yet again, the ‘second sin’ and cursed the intruding mages into mindless, poisonous creatures that would breed and plague the world upon their return. It took almost one-hundred years for these creatures to be defeated but, just like Sin in FFX, these creatures keep returning to purge the earth. It is the price for past sins. This symbolic punishment in both videogame worlds can be compared to the punishment that God placed on Adam and Eve, and upon all their descendants, “To the woman he said, “I will greatly increase your pains in childbearing; [ … ]” To Adam he said, [ … ] “…By the sweat of your brow you will eat your food until you return to the ground…”‘ (Gen. 3:16-17-19) While this is not as drastic as the returning purges within the two videogames, it is hard to ignore the similar connotations. The final religious distinction to make within both games is the clear representation of a martyr who dies for the people, although depicted very differently in each story. 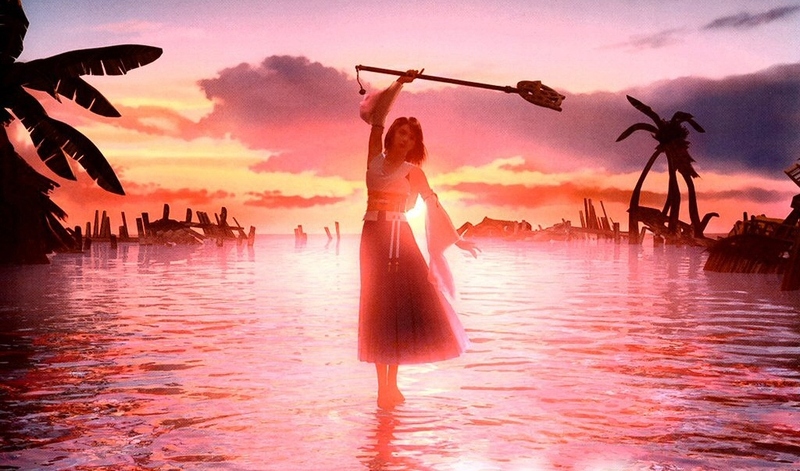 In FFX, summoners, like the protagonist Yuna, are trained to temporarily ‘defeat’ Sin by using magic instead of machina. This magic, however, has killed every summoner who has confronted Sin whilst using it. It is a case of magic versus machine; magic is the solution in FFX and the downfall in DA2. Summoners must martyr themselves to protect the people as a whole. No solution is offered to these summoners and their companions – there is no alternative; the church is complicit in this. This can be compared to Jesus who theoretically died for our sins, ‘For as in Adam all die, so in Christ all will be made alive.’ (1 Cor. 5:22), and now we are atoning for the ‘original sin’ through the summoners sacrifice. As said by a character in game, “She [a summoner] must ease the suffering of all Spira. 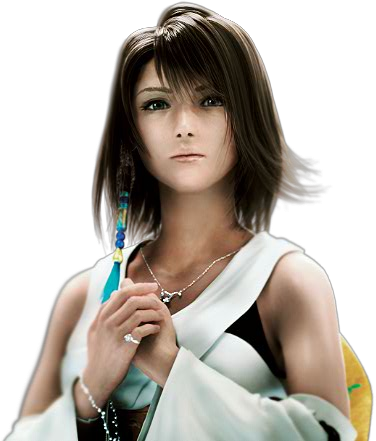 She must be a leader for the people.” (Lord Seymour, FFX, 2001). The people of Spira are trapped in their religious beliefs in the hope that one day Sin will be vanquished. Kelk: Branded a traitor, but still you would fight Sin? Lost to the temple, hated by the people, yet you continue your pilgrimage? Everything lost! What do you fight for? In Dragon Age history the same value of importance is placed upon a woman called Andraste who claimed to be the mortal bride of the Maker. She proclaimed that if people worshiped Him once more and reined in their wicked use of magic, He would return to caring for the world. Andraste fought a long and bloody war for the freedom of slaves and to spread ‘the Maker’s word’, but was eventually burned at the stake. This act lost the Maker’s love yet again – the ‘third sin’. Upon closer inspection, Andraste’s life is undeniably similar to Joan of Arc (and even draws parallels with Queen Boudica), including the manner of her death, but compared to Summoner Yuna this figure of salvation is proactive and brutal. 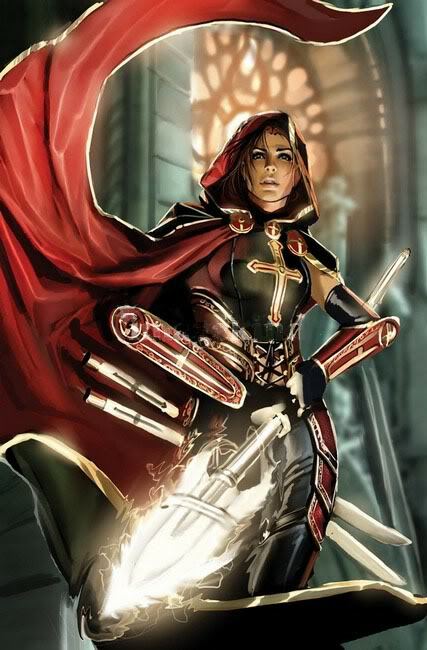 Both women’s role within the two religions is that of a messianic Christ-figure but Andraste’s death does not achieve salvation, like Christ, and neither does it give the people a respite from the war, like a summoner or Joan of Arc. Instead, the Andrastian Chantry was formed hundreds of years later based upon her teachings and mages were oppressed out of fear; locked away and watched by the Chantry’s militia. Magic must serve man and never rule over the world again. When Yuna learns the terrible details of the ritual required to defeat Sin she is dismayed, but it is her lover, Tidus, who demands more answers. Only then do we learn the missing piece: that Sin is reborn from the ritual. Once they understand the futility of their efforts – that Sin is purposely kept alive by the Church of Yevon – Yuna refuses the sacrifice and begins a new journey to defeat Sin once and for all, even if that means she must use forbidden machina. This is obviously a huge leap for the characters to make, especially for Yuna who was raised as a Yevonite, but there is little reason for the gamer to oppose this heresy. As Bogost explains, ‘Persuasive games expose the logic of situations in an attempt to draw players’ attention to an eventual site and encourage them to problematize the situation.’ (2007, p. 332) The problem here is that Yuna must prove the Church is a lie. Religion is often a source of hope for people. Saints, symbols and mantras serve as unquestionable stability within peoples’ lives, a code to rely upon when the world becomes too terrible or confusing to deal with – especially in a world like Spira where there is the constant threat of being attacked by Sin. The gamer is led through Yuna’s path of contemplation as she breaks down the reasons why it is ultimately better to defy the Church. Unlike in DA2, all of Yuna’s companions come around to her way of thinking and fight to destroy not only Sin, but everything each of them has believed in. This conclusion seems logical as the question of “right and wrong” is not too difficult to make. The conflict is internal. Coming to terms with the corruption of the Yevon Church is tricky, but actively destroying it is easier for the gamer than the characters. At the end of the game, Yuna gives a speech to the people in which the Yevon Church is renounced as false and Spira can face a new age. While there is emphasis on ascending from a despairing cycle – there is no reason to feel guilty any more – emotional value is placed on love and friendship; working together. The final images are flashes of Yuna’s companions from throughout her pilgrimage. 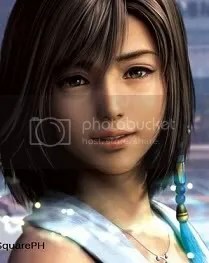 There is one shot of when she almost gave into the Church rather than fight against it, before a final, lingering image of the man she fell in love with, Tidus. Ultimately, there is a sense that Yuna has done something wonderful. She is a hero for uncovering Yevon and destroying Sin. Now society can begin anew and join hands to rebuild the world. DA2’s ending, in comparison to FFX’s, however, is much different. The final feeling at the end of BioWare’s game plays significantly on guilt, justice and the fact that reality is never black and white: sometimes the only options one has in order to progress are both nasty. It is a matter of seeing the bigger picture and picking the lesser of two evils. In DA2 this has a stronger impact on the gamer as the story unfolds from a first person perspective and, as Bogost explains with this kind of roleplaying experience, ‘The object of the persuasion [you] is held accountable, even held hostage for response.’ (2007, p. 318) The gamer must choose the best course of action based on the arguments presented to them, and their decision greatly affects the overall outcome. The story changes depending on the decisions the protagonist (known as ‘Hawke’ from here on) makes, unlike the third-person narrative in FFX where you will end up at the same resolution no matter what. 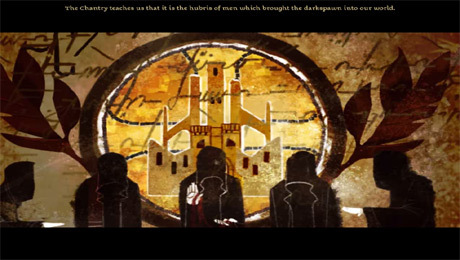 This forces the player to make controversial or tough decisions that can determine whether key characters, like the revolutionary mage Anders, live or die. 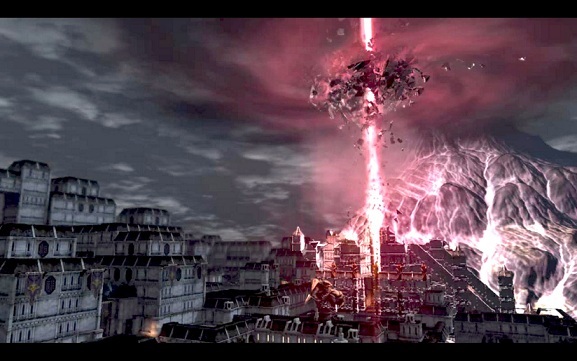 Some background knowledge is required to fully understand the build up to DA2’s theme of religious reformation. As mentioned before, the Chantry’s main belief is that “Magic exists to serve man, and never to rule over him” (Transfigurations 1:1-1:5). Mages are watched every minute of the day by the Chantry’s militia to the point of living in constant fear, oppression and unjust punishment if accused of wrong doing. 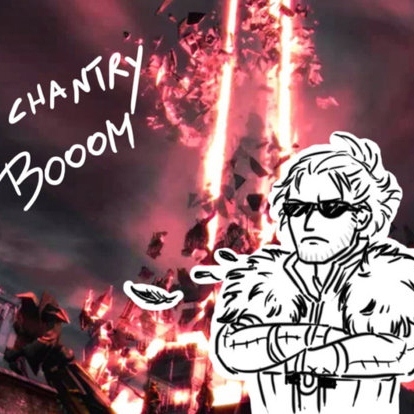 It builds up to where the revolutionary mage Anders literally blows up the Chantry, killing the Grand Cleric and all her priests. Hawke is then caught in the middle of two opposing sides: the militia or the mages. Anders makes a similar argument: the Chantry is a form of compromise and placation, not a means to improve their culture’s attitude towards mages. 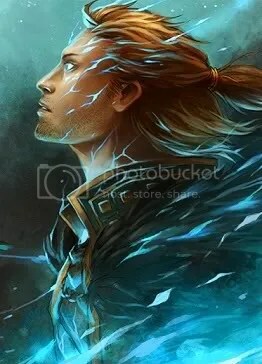 He even says, “I removed the chance of compromise, because there is no compromise.” (Act 3, DA2, 2011) What he means is: the lives of people are not things to be compromised on, mage or otherwise. Compromising has not improved the welfare of mages, it has only altered the depravity in which they live. What’s the outcome of these games and what are they trying to tell us? In FFX, when it is suggested that the characters should bring down the Church there is little resistance. It does not take long for all the characters to come to a consensus. The arguments of the opposing side are weak and easy to prove wrong, especially as every character feels betrayed rather than attacked. In DA2, after the Chantry is obliterated along with the Grand Cleric, there is a severe split in opinions within Hawke’s companions. FFX is an emotional story that focuses on a small group of people. The theme of religious reformation and salvation is achieved through sacrificing ones beliefs and disbanding the Church. It would seem the message is to take action if one sees corruption and understand where ones beliefs come from. In DA2 the solutions are unclear. Anders tries to place greatness in people and mages by taking it from the divine. Without the Chantry to quell both sides of an argument: suppress the mages or free the mages, Hawke is forced to pick and fight for one side instead of hoping the issue will solve itself. It raises notions like: terrorists are people too, being aware of the world around you is important, religion might be one of the key powers holding us back from ‘purposeful autonomous behaviour’ and, last but not least, is violence ‘OK’ if it is the only way to be heard or instigate change? Unlike FFX, there is no clear answer at the end of the game. All decisions are left up to the gamer. Even the final character to speak in DA2 expresses how disturbed she is to learn of ‘the truth’. As a soldier of the Chantry she believed Anders and Hawke needed to be found, forced to repent and then executed, but once she learns how things escalated into the Grand Cleric’s death, she is no longer sure if she is fighting for the right reasons. Discover more of Helluin’s lenses! Check out her Final Fantasy Lensography. Dragon Age II, 2011 [videogame]. Lead writer Gaider DAVID. USA: BioWare. Final Fantasy X, 2001 [videogame]. JAPAN: Square. ANON., 2009. Holy Bible (NIV) New International Version. CHINA: Hodder & Stoughton. BOER, R., 1998. Ezekiel’s Axl, or anarchism and ecstasy. In: AICHELE, G., & PIPPIN, T., ed., 1998. Violence, Utopia and the Kingdom of God: Fantasy and Ideology in the Bible. NY: Routledge. BOGOST, I., 2007. Persuasive Games: The Expressive Power of Videogames. USA: The MIT Press. CALLEJA, G., 2011. In-Game: From Immersion to Incorporation. USA: The MIT Press. MAKINS, M. et al., 1999. Collins Shorter Dictionary and Thesaurus. 5th ed. UK: Omnia Books Limited. STUDIO BENTSTUFF, ed., 2001. Final Fantasy X Ultimania Omega. JAPAN: DigiCube. I haven’t played FFX but I’ve completed Dragon Age 2 a few times and it is an excellent game. I really enjoy the complicated society created within it and the interesting character portrayals. It’s always refereshing to play a game whereby the choices aren’t always `black’ and `white’ and where you are as you put it `forced to think and take responsibility for their actions’. I also found the fact that your group have differing opinions within them and how they respond to you is affected by those decisions a much more honest approach to leadership and society. Great article! Very detailed and interesting. Yes, I love that your companions disagree with you and challenge your decisions. I think it makes a gamer a little less passive – they have to consider how their actions will affect not just their own character, but the others around them. I’m so glad you liked this article. Thanks for reading!